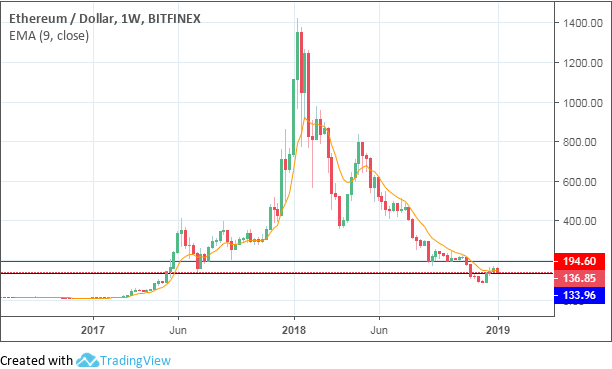 Ethereum (ETH-USD) has gained close to 100% from its Q4 2018 lows, but is now in a bit of a retreat as those who bought into the lows of early December 2018 have started to take some profit. However, this uptick is not actually an upside reversal, but more of an upward retracement of the long-term downtrend. ETH/USD is still technically in a downtrend and we need to see more of a positive change in the fundamentals for us to start seeing the bullish runs of 2017 and early 2018. The Ethereum community focus has shifted to the recent 51% attack on Ethereum Classic, the original chain of Ethereum that the ETH asset and chain “hard forked” from. This doesn’t have any immediate affect on ETH price except for investor confidence at this still new technology and the ability of a force to essentially “take over” the chain through mining power. Risks like this, combined with the increasing difficulty of mining and the environmental and energy consumption factor, give all the more reason for the Ethereum development team to continue its focus on “staking“—rewarding ETH holders instead of miners for maintaining the legitimacy of the network. The $133.96 price level is functioning as a long-term support. This is the site of previous lows that were last seen in July 2017. Price action dipped below this level to the lows of May 2017, before experiencing a rebound in late December 2018. Price has begun to dip once more on the back of some profit taking from those who bought into the December 2018 lows. With price now at $136.85, it’s expected that a test of the long-term support at $133.96 will occur within the next three days. To get a clearer picture of the price moves in the short-term, we turn to the four-hour chart where a trace of the Fibonacci retracement tool sheds more light on what the future price action may be. We can see from the chart that the upward corrective move from December 2018 (ETH/USD is still technically in a long-term downtrend) only hit the 61.8% Fibonacci price level, after which the retreat resumed and broke through the 50% Fibonacci price level. Price is now testing the 38.2% Fibonacci price area at $134.78, and further price action will depend on whether this area will hold or not. So with these pictures in mind, what are the possible price moves for ETH/USD in the month of January 2019? The price is virtually sitting on a long-term support as can be seen on the weekly chart, where the $133.96 price level is playing this part. Price is therefore expected to test this support area, especially as this area also is very close to the 38.% Fibonacci price level visible on the four-hour chart. The question that the price candles on both charts must answer is whether they will be strong enough to break below the existing support levels on which they rest, or whether they will simply test these levels without breaking below them. 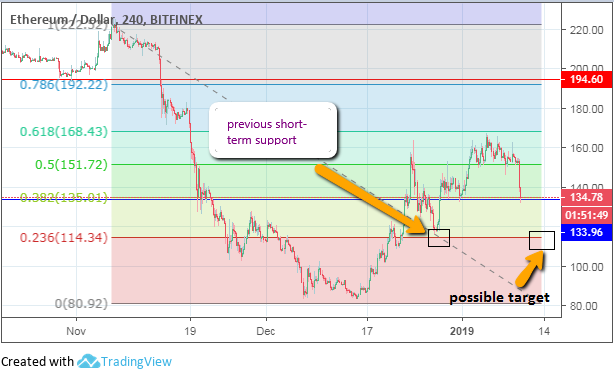 A test of these support areas without a corresponding break will see price action ranging between the 38.2% Fibo level as the short-term floor, and the 50% Fibonacci price level acting as the ceiling in the range. This situation may persist for the next few days and will serve as a good experience for range traders. However, we also should watch for a successful break of the long-term support level. If this happens, i.e. the candle closes below the $133.96 price level with a 3% penetration, then price will make a push for the next available support area. On the four-hour chart, the next short-term support is at the 23.6% Fibonacci price level, which is at the $114.34 price level. So this should be a level to watch out for following a break of the current support level seen on both the weekly and four-hour charts. As long as there is no fundamentally positive news release for Ethereum in the next three weeks, we do not expect January 2019 to present price movements that will break the current highs of $168.43. Selling on rallies may be the predominant sentiment in the market this month. Please note: The price moves mentioned above are expected to take a few days to play out, as most of the analysis is done using short-term charts. Well, the crypto craze may have deflated. But that’s not a bad thing! In fact, if you still believe in the transformative power of blockchain, it means that many of these technologies are back to early adopter prices. At the Coin Agora, our focus is on altcoins – the smaller cap cryptos that have massive potential to disrupt business ecosystems. Don’t miss out—the price craze may return in 2019 and it’s your chance to get in now. Let us help you cut through the noise and find winners – join the Coin Agora community today! Disclosure: I am/we are long ETH-USD. I wrote this article myself, and it expresses my own opinions. I am not receiving compensation for it (other than from Seeking Alpha). I have no business relationship with any company whose stock is mentioned in this article.